Sometimes the biggest surprises come in the smallest packages. Scientists at Pacific Northwest National Laboratory (PNNL) contributed to a recent Nature Microbiology letter on novel metabolic strategies in the ocean bacterium Pelagibacterales (SAR11). These carbon-scavenging marine organisms are sub-microscopically tiny, yet account for a third of all microbes living on the surface of the world's oceans. Results: To their surprise, the scientists discovered that some of SAR11's metabolic circuits stay activated all the time. "The lights in the house are always on," said corresponding author Stephen Giovannoni, an Oregon State University marine biologist. "We were not expecting this story at all." He noted that most genes switch on and off as they are needed. For the paper's data on SAR11's gene switches, he turned to PNNL proteomics experts Joshua T. Aldrich, Mary S. Lipton, Carrie D. Nicora, Richard D. Smith, and Samuel H. Payne. SAR11's hardwired metabolic circuitry is a "survival mechanism" for an organism that lives a calorically boom-and-bust existence in nutrient-poor regions of the open ocean, said Lipton. "It's very energetically costly for an organism to start ramping genes up. Being prepared all the time, SAR11 can take advantage of the nutrients as they come along." The study uncovered other surprises. For one, SAR11 makes methanethiol, a sulfur gas, in amounts far greater than scientists previously knew. SAR11 also makes another sulfur gas, dimethyl sulfide (DMS), a nutrient processing "degradation product" previously unknown in this microbe. Such DMS production is controlled by the gene SAR11_0394. That function was recognized only now by Giovannoni and his team, despite scientists doing extensive genomic and metagenomic work on SAR11 for years. Lastly, researchers were surprised to find two sulfur gas-making degradation pathways in SAR11 - one for DMS and one for methanethiol. 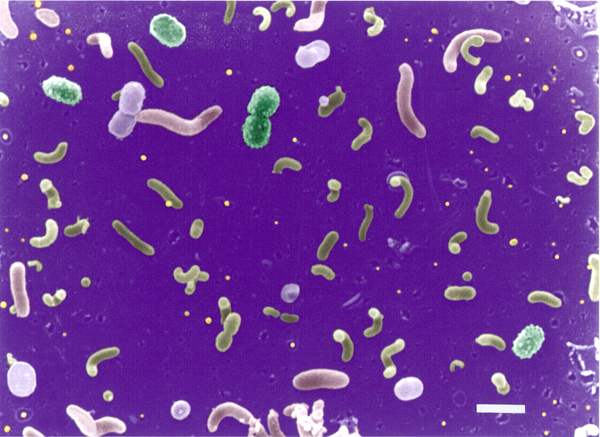 This is a surprise because the organism's genome is among the smallest of any free-living microbe. Its tightly packed genome is barely more than 1,000 genes long. Its small size, simplicity, and robust survivability in the face of harsh conditions makes SAR11 attractively elegant. "We think these cells evolved this way, with very small, genomes, a very long time ago in the oceans," said Giovannoni, who recalled that Leonardo da Vinci once equated elegant simplicity with sophistication. "It's an ancient trait, but not primitive, because these are the most abundant cells on the planet today. They are very successful with this strategy." Why It Matters: The atmospheric impacts of SAR11 and bacterioplankton like it are enormous. "These cells oxidize a very large amount of total photosynthesis that occurs on Earth every day," said Giovannoni. Of all the world's organic carbon produced through sunlight, SAR11 converts from 5 to 22 percent of it to CO2. As for the paper itself, he added, "The whole world now works on genome predictions." But studying something as old and small and simple as SAR11 may point to a new direction for biologists studying larger and more complex genetic systems. "We've been mesmerized by genomics," said Giovannoni, "but here we see a really simple form of regulation happening at the biochemical level." Then there is the impact of understanding how microbes and microbial communities operate in their real-world environments, including metabolic strategies that assure survival, like the ones the SAR11 discoveries illustrate. "There's so much we don't know about microbes in nature," said Lipton, a microbiologist with postdoctoral training in mass spectrometry. "They make up our oceans, soils, and lakes. They make up everything around us. We don't understand how they survive or interact as a community." Methods: At PNNL, Lipton and others applied the standard proteomic technology to unlock gene-switching mechanisms in SAR11. A strain of Pelagibacterales called HTCC1062 was grown in artificial sea water, cultured samples were subjected to chemical analysis to measure SAR11 metabolic products, and mass spectrometry was used to identify the proteins involved in the synthesis of SAR11's signature sulfur gases. "A lot of the genes here expressed at very low levels, so the advanced sensitivity of our instruments helped," said Lipton. What's Next? Giovannoni and his team at Oregon State University's High Throughput Microbial Cultivation Lab will publish a paper soon on dissolved organic carbon cycling by SAR11. And related field research is under way in the North Atlantic on the production of DMS and methanethiol by plankton. Sponsor: DOE Office of Biological and Environmental Research (BER), Pan-omics program at PNNL. Research Team: Joshua T. Aldrich, Carrie D. Nicora, Mary S. Lipton, Richard D. Smith, Sam Payne, PNNL; Jing Sun, Yanping Qian, Michael C. Qian, Patrick De Leenheer, Cleo L. Davie-Martin, Kimberly H. Halsey, and Stephen J. Giovannoni, Oregon State University; Jonathan D. Todd, Emily K. Fowler, Andrew W. B. Johnston, University of East Anglia, UK; J. Cameron Thrash, Louisiana State University; Ben Temperton, Plymouth Marine Laboratory, UK; Jiazhen Guo, Qingdao Aquarium, China. SAR11's newly discovered hardwired metabolic circuitry is a "survival mechanism."